This weekend trip features the nature and historical wonders hidden deep in the interior city of Jiangshan in Zhejiang Province. 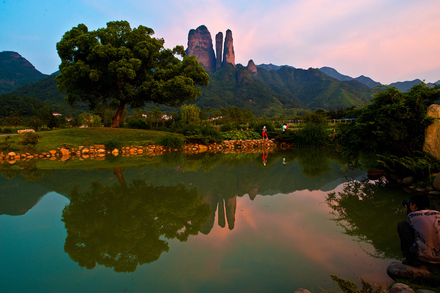 On day one we will head to Jianglangshan, a scenic reserve that features Danxia, a geological wonder of red sand stone mountains which is listed as a World Natural Heritage Site by UNESCO along with Guangdong’s Danxia Mountain. Later check into the ancient town of Nianbadu, a town with over 1100 years of history. It was once an important military garrison town and transportation hub due to its strategic location on the border of Zhejiang, Fujian, and Jiangxi province. The next day we’ll hike the ancient Xianxia Caravan Trail. 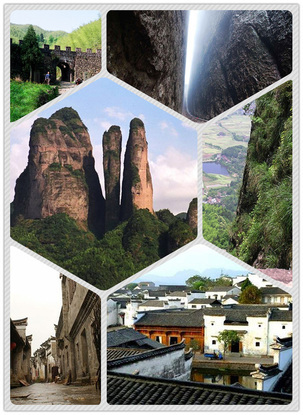 Located deep in the Chong Shan Mountains, this trail was first built by general Huang Gou for the invasion of Fujian during the Tang Dynasty in around 878 AD, but had gradually became a caravan trail for traders between the two provinces. The total length of the original trail was about 120 kilometers, up until 1932, this was the only path connecting Zhejiang and Fujian. Now much of the trail has disappeared due to new roads built. We’ll do one hour's hiking on the remains of this ancient trail near Nianbadu, where the ancient passes still exists. Includes: high speed trains; local minivan transfer; guide cost; lunch & dinner on D1 and breakfast & lunch on D2; accommodation and admission tix to scenery areas; bottled water. 07:45 - Meet at the Shanghai Hongqiao train station, board the train G85 at 08:00; arrive Jiangshan Station at 10:35 via Hangzhou. 08:30 - free walking inside Nianbadu Ancient town or follow guide to explore the town. 12:50 - Drive to train station to board train G7376 back to Shanghai which leaves at 14:11 and arrives Shanghai Hongqiao Railway Station at 16:34.